Insectiride is a battle minigame in Mario Party 6. Its name is a pun on "insecticide," a chemical that is used to kill insects. The camera shows each of the vehicles. It then cuts to the view shown during the race, then zooms in on the stage in front of the racetrack before the minigame starts. 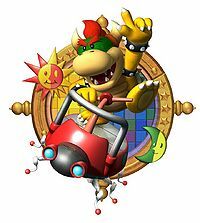 Each of the players is racing to get to the other side of the small stretch of land in their insect-automobile first; each player is given 30 seconds to select a vehicle. 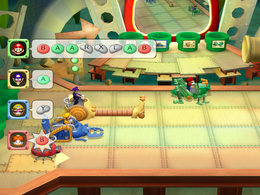 At the start of the game, each player is able to choose one of four insect vehicles to use in the race; they are given a small description when they stand in front of one. The four vehicles are a beetle, a ladybug, a snail, and a grasshopper. Once the minigame starts, the players must press a certain array of buttons depending on which insect they chose. The minigame ends when at least three of the players have crossed the finish line or if five minutes are up. 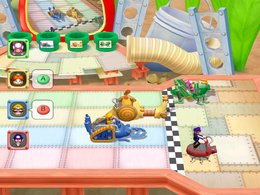 Players take their place on a podium on the stage from the beginning of the minigame based on their rank obtained in the race. Only the first-place winner, however, performs their victory animation as confetti rains down upon them, though the overall loser performs their losing animation. The screen in the background shows the winner's vehicle. If five minutes pass and no one has reached the finish line, all of the players will be in last place and perform their losing animations. Ladybug – "Press the button ten times quickly!" Snail – "Press when it extends!" Grasshopper – "Press the eight buttons as instructed!" Beetle – "Press the buttons as instructed!" Rules – "Pick a locomotion machine and start racing! Whoever reaches the goal first wins!" Advice – "Press the buttons as directed to claim victory!" This page was last edited on March 3, 2019, at 01:01.